The obliquus capitis inferior (OCI) muscles may be the most underappreciated of all the suboccipitals. Arising from the spinous process of C2 (axis) and inserting on the transverse process of C1 (atlas), their primary function is head-on-neck rotation. Notice in Image 1 how the overstretched left OCI creates reciprocal shortening on the right. During intake exams, habitual stomach sleepers often recount waking one morning unable to turn the head left without triggering upper neck and head pain. Many of these stomach-sleeping headaches are rooted in neurovascular tension or compression from mechanical strain. In this article, I’ll present cervicogenic headache research, propose biomechanical explanations, and demonstrate Myoskeletal Alignment Techniques (MAT) for treating stomach-sleepers’ headaches. Mechanoreceptive and nociceptive bombardment from overstretched spinal ligaments, joint capsules, and suboccipital muscles may wreak enough havoc to convince the brain to protectively guard or elicit pain. Image 4, Image 5, and Image 6 demonstrate an effective MAT routine for releasing hypercontracted right-side OCI muscles, a gentle atlas-axis alignment technique, and a graded exposure stretch to relieve sympathetic guarding. Since the nervous system directs all bodily functions, it behooves today’s therapist to acquire skills for treating mechano-sensitivity in neural structures. Some therapists engage the nervous system via gentle skin manipulation, some through fascial stretch, and others, such as myself, include mobilizations for bones attaching to the dura mater. One of the ﬁrst to focus on cervicogenic head pain was famed spine researcher Nikolai Bogduk, MD, PhD. In his 1995 paper “Anatomy and Physiology of Headache,” Bogduk writes: “All headaches have common anatomy and physiology. 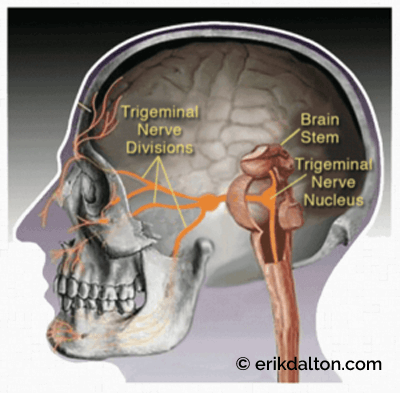 All headaches are mediated by the trigeminocervical nucleus and are initiated by noxious stimulation of the endings of the nerves that synapse on this nucleus.”1 Bogduk explains that head pain arises from overstretched and compressed upper cervical spine dura and nerve roots (Image 2).In a 2011 study published in the journal Spine, Frank Scali and colleagues state that optimal suboccipital balance prevents abnormal dural tension during atlas-axis rotation and occipitoatlantal ﬂexion and extension.2 Interestingly, in 86 percent of the study’s dissected cadavers, OCI ﬁbers penetrated the C1–2 interspace. Image 4: The therapist’s right thumb contacts the C@ spinous process and glides slightly superolaterally on the OCI (Fingers drape face). The client inhales while gently right rotating his head against the thumb and hand resistance. The client exhales and the thumb maintains sustained OCI pressure as the client slowly left rotates the head. Repeat. Image 5: With elbows on the table, the therapist flexex the client’s head 45 degrees and left rotates to the first restrictive barrier. The client gently right rotates against the therapist’s resistance to a count of five, rests, and left rotates to the new restrictive barrier. Repeat and attached to the dural membrane. In this scenario, the stomach-sleeping client rises from bed and attempts to left rotate his head back to neutral. 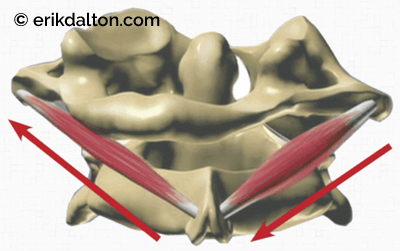 Optimally, the atlas vertebra rotates with the head, but with a neurologically shortened right OCI, the atlas drags the axis with it. 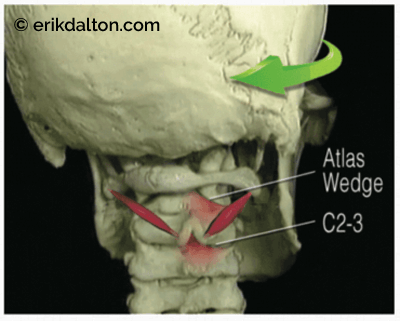 Left untreated, an “atlas wedge” causes chronic OCI spasm that ﬁxates C1 on C2 (Image 3). If the head is forced to left rotate, the joint jamming moves down the chain to C2–3. With the dura ﬁrmly attached to only three spinal segments (foramaen magnum, C2–3, and sacrum), the brain abhors bony disturbances at this key neurological center. Image 6: Graded exposure stretch. Keeping the client’s head flexed at 45 degrees, the therapist uses a counterforce to slowly rotate and drag the neck fascia superiorly. Repeat. Clients must understand that the brain is their best friend, and pain is there to protect their body from further perceived insult. It’s tempting but counterproductive to tell clients their pain results from muscle spasm, trigger points, or bones out of place. As discussed in my San Diego Pain Summit column (“Changing the Brain’s Mind About Pain,” Massage & Bodywork, July/August 2015, page 101), clients simply need to be reassured they are in a safe place, and that everything is all right, right now. F. Scali, E. S. Marsili, and M. E. Pontell, “Anatomical Connection Between the Rectus Capitis Posterior Major and the Dura Mater,” Spine 36, no. 25 (December 2011): E1612–4.